The first step in the management of Coronary Heart Disease (CHD) is the designation of a definite diagnosis. Correct diagnosis is important, because if a diagnosis of CHD has been made, in which are likely to have the sense that people will be able to experience cardiac infarction or sudden death. Diagnosis is wrong always have bad consequences on quality of life of patients .. In addition, their opportunities for employment, may be reduced. If this happens to older people, then they probably should have retired too early, to be repeatedly hospitalized to eat excessively or drugs of potential toxins for a long time. On the other hand, fatal consequences can occur when the presence of CHD is unknown or if the presence of other cardiovascular diseases that cause angina pectoris missed and go undetected. Any patient with chest pain needs to be done a thorough anamnesis, the determination of risk factors, physical examination and ECG. 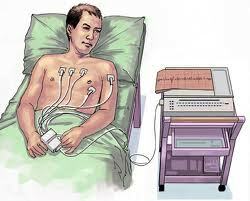 In patients with mild symptoms of angina pectoris, fairly non-invasive examination. When patients with severe complaints and takes action and the possibility of revascularization, the action was an indication of angiography. On the dubious circumstances to do the treadmill test. The treadmill test is more sensitive and specific compared with resting ECG and a test of choice for detecting patients with angina pectoris and the possibility of this examination the ingredients are easy and affordable cost. 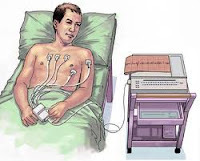 In certain circumstances, it is difficult to interpret the results of the treadmill as in patients with resting ECG abnormalities, among others. : LBBB, repolarization abnormalities, LVH and so on. jantung koroner, penyakit pembunuh no 1 di dunia sudah semestinya selalu kita waspadai ya..
keren dan bagus mbah salam. terima kasih kang, apa ada halal bihalal blogger TA?